262 pages | 16 B/W Illus. 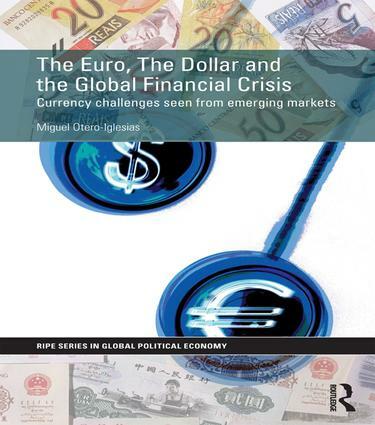 This book analyses how financial elites in key dollar-holding emerging markets perceive the contest between the euro and the dollar for global currency status. It also assesses how far the Eurozone has gone in challenging US hegemony in monetary affairs through the prism of these elites. Drawing on Chartalist and Constructivist theories of money, the author provides a systematic approach to studying global currency dynamics and presents extensive original empirical data on financial elites in China, Saudi Arabia, the UAE and Brazil. The author demonstrates, amongst other things, how the gradual ascendance of a structurally flawed currency like the euro has highlighted the weaknesses of the dollar ad how the euro has demonstrated that sovereignty sharing in monetary affairs is possible and that the international monetary system can be a multicurrency and multilateral system. In this highly innovative and important book, Otero-Iglesias shows the importance of studying financial elites in Brazil, China and the GCC countries in order to understand the full impact, material and ideational, of the euro in the transformation of the IMS. It will be vital reading for students and scholars of International Political Economy, International Economics, International Finance, Economic History, Economic Sociology, International Relations, Comparative Political Economy and Comparative Politics. Many scholars have contributed to ongoing debates about the competition between the dollar and the euro for global monetary dominance. Few have added as much value as Miguel Otero-Iglesias with his systematic and original survey of the views of financial elites in major emerging market economies. Where conventional interpretations emphasize material "reality," Otero-Iglesias's ideational analysis clearly demonstrates how important it is to consider as well how "reality" is perceived and framed by key actors. The euro may be structurally weak, limiting its "hard" power. But at the cognitive level of "soft" power, Otero-Iglesias suggests, Europe's money poses a significant challenge to America's greenback. This is an argument to be taken seriously. Benjamin J. Cohen, Louis G. Lancaster Professor of International Political Economy University of California, Santa Barbara, USA. This is a book I’ve been waiting for: a detailed analysis of what financial elites in the large reserve-holding countries are thinking about the future of the international monetary system. Drawing on extensive research, Miguel Otero-Iglesias argues persuasively that the views of authorities in China, Brazil, and the Gulf states matter enormously for the future of the global roles of dollar and the euro. An engaging and innovative book that makes a major contribution to our understanding of the world’s money." In this original, well written and carefully researched book, Otero-Iglesias suspends motion in this fast moving story of currency rivalry to give the reader a view into the deeper logic of global monetary change. The author has synthesized skilfully across a wide spectrum of perspectives, from various systemically important emerging countries, and for which he has accessed key financial elites, and policy shapers, in China and Brazil, as well as the Gulf States. This book is truly a must read for scholars of the politics of the international monetary system, especially those with an eye to systemic change. Miguel Otero-Iglesias is Senior Analyst on the European Economy and the Emerging Markets at the Elcano Royal Institute in Spain and Research Fellow in International Political Economy at the EU-Asia Institute at ESSCA School of Management in France.